This is the final of three posts dedicated to The Made in 1938 Blogathon being held over at In The Good Old Days of Hollywood and Pop Culture Reverie. Tnx Crystal and Robin for letting me take part! Brief Synopsis – A former bootlegger gone legit must find a way to deal with unexplained corpses in his house before he is wrongfully accused of the murders. 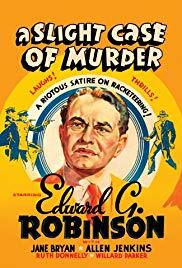 My Take on it – This is a film based on a play that I decided to watch for this blogathon because I was interested in seeing of Edward G. Robinson would succeed in a comedy like this that sounded quiet interesting. Unfortunately, it doesn’t come even close enough to being enjoyable as one would hope. Robinson is out of his element in comedy and this just doesn’t manage to show his acting talent well enough. Using him in this kind of role actually hurts the film a bit because it is quite difficult to actually envision or imagine him in such a role. The story arc is put together in an interesting way and they manage to add some fun elements into the story that work on the most part. It also helps that with all of the chaos in the story that they find a way to tie it all together nicely by the end. The supporting cast doesn’t manage to help enough to keep things fun enough. Unfortunately, this film comes across as a bit too underwhelming for its own good. Bottom Line – Interesting idea that just doesn’t work as well as one would hope. Robinson isn’t the best comedic actor and that actually hurts the premise a bit since it’s hard to imagine him in such a role. The story arc is interesting and they manage to add some fun elements into the story that are all neatly tidied by the end. The supporting cast also don’t manage to help enough to keep this film fun enough. The whole things comes across as bit too underwhelming for its own good. I’ve always been a fan of Edward G. Robinson, but have never seen this film. I want to see it now, just because of your review. It has peaked my interest. I have heard him do some “less serious” roles on radio that played for some “comedic” effect. In a Suspense episode entitled “The Man Who Wanted To Be Edward G. Robinson”, for example, he plays a double role. He plays a meek husband who becomes obsessed with being like the tough guy characters he sees Robinson play on the screen. He also plays himself. The meek husband actually meets EGR and begs him to help kill his wife. I heard him in a similar radio play, The Whole Town’s Talking, where he plays a clerk mistaken for a gangster. In it he also plays dual roles. I understand he started in a movie version of this, but I haven’t seen it either. Thanks for your write up! I will check it out just to see Robinson.